The Ju 87 V1 in the form in which it was originally flown with twin vertical tail surfaces. This arrangement was found to be susceptible to flutter. Весной 1935г. (точная дата не зафиксирована) совершил первый полет первый пикирующий бомбардировщик Ju 87 (фото). Ju 87, оснащенный двигателем Rolls-Royce Kestrel и уникальным двухкилевым оперением, был призван сыграть важную роль в событиях осени 1939 года. 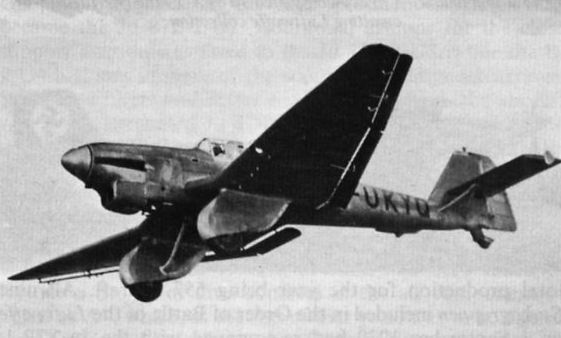 The Ju87 V1 is seen after the radiator bath for its Kestrel engine had been extended forward and substantially enlarged shortly before the aircraft was lost as a result of a structural failure in the tail following flutter. The Ju 87 V2 was the first prototype to be fitted with the Jumo engine, but in other respects differed from the V1 solely in having redesigned tail surfaces. 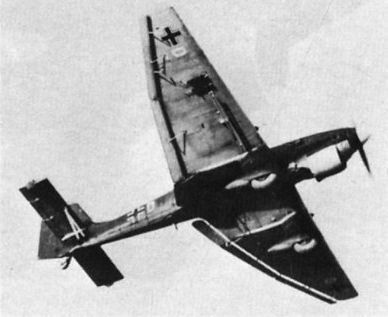 This prototype underwent dive trials at the Rechlin test centre. 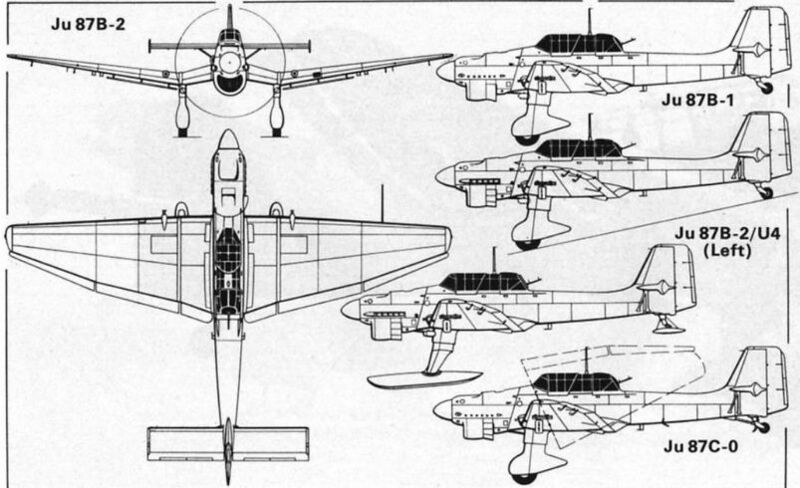 The Ju 87 V3 featured a lowered engine thrust line, an enlarged rudder, small endplates on the tailplane and a longer-stroke tailwheel leg. 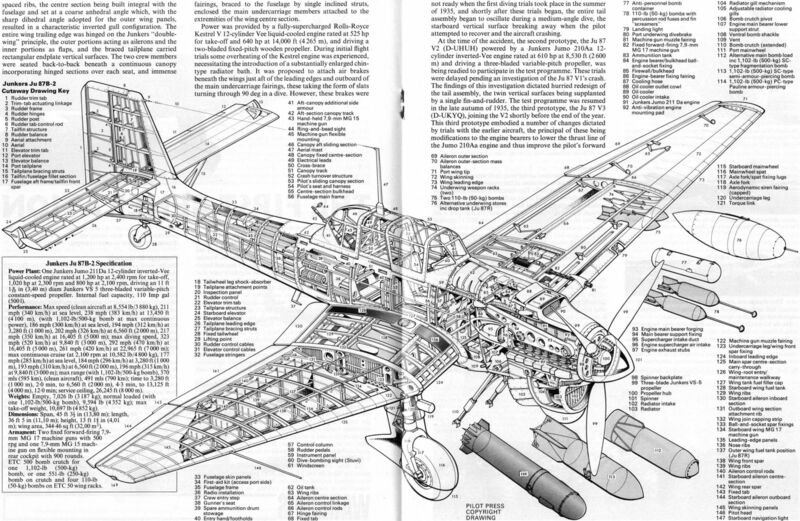 The Ju87 V4 was essentially a production prototype embodying further revision of the thrust line, a lengthened wheelbase, longer-stroke main undercarriage legs with recontoured fairings, redesigned vertical tail surfaces and revised tailplane bracing. 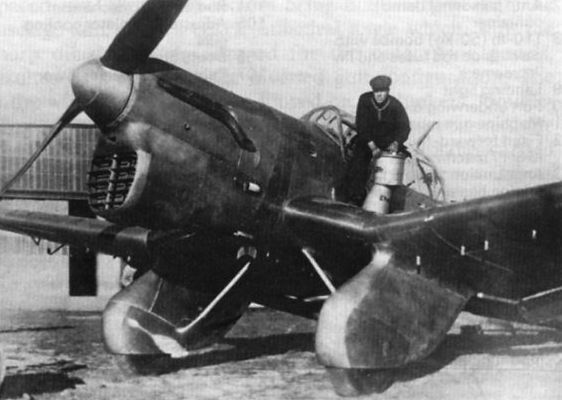 The rear portion of the cockpit canopy was also revised. 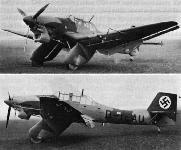 Few further changes were introduced by the initial production version, the Ju 87A-1. 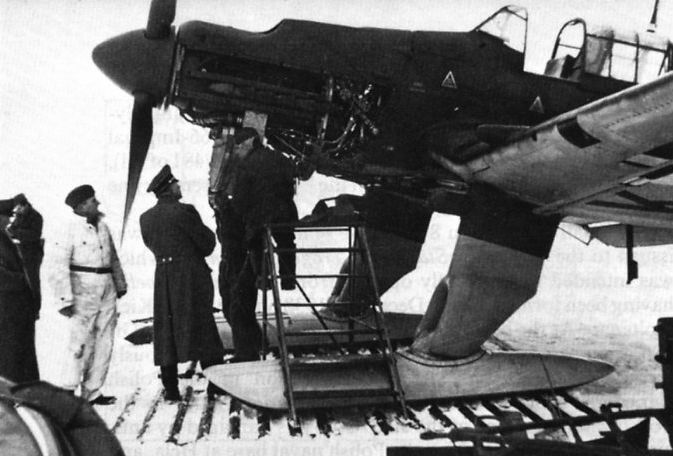 A newly-completed Ju 87A-1 (the twelfth aircraft) awaiting Luftwaffe collection. 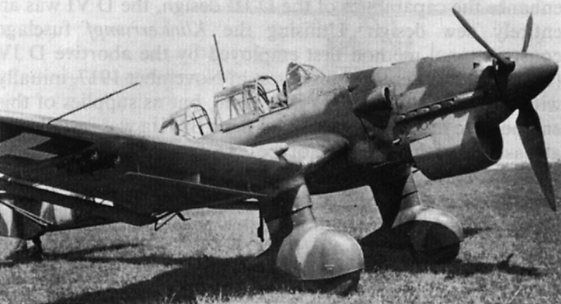 A Ju 87A-2 of III/St.G.165 in the summer of 1938. 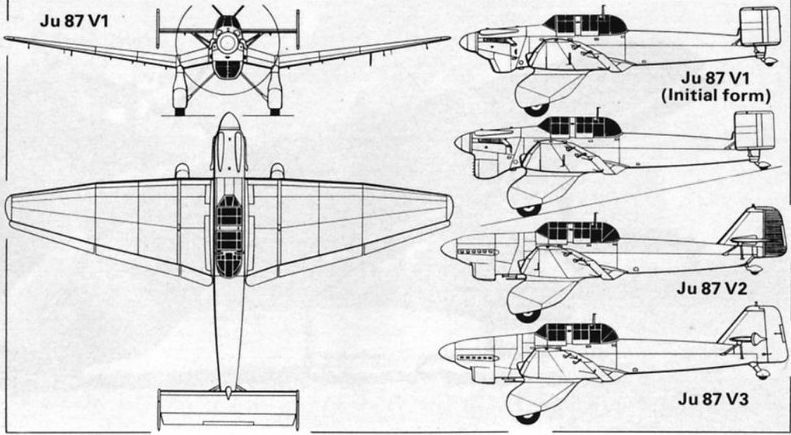 The A-2 version of the dive bomber differed from the initial production A-1 essentially in having the marginally uprated Jumo 210Da engine and a broader-bladed propeller. A Ju 87A-1 of the "Kette Jolanthe" operating in Spain from late 1937. A Ju 87B-1 of l./St.G.1 which also participated in these operations, both Stukagruppen later flying in the Mediterranean area. The Ju 87B-2 succeeded the B-1 on the “Weser" assembly line late in 1939, and embodied various refinements. A Ju 87B-2 of I/St.G.3 operating from Derna, Libya, in 1941. Note the sand yellow upper surfaces and light blue lower surfaces. 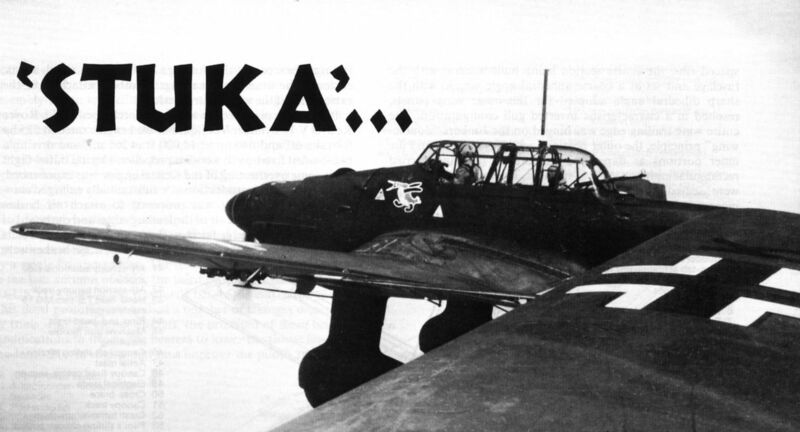 A Ju 87B-2 of 4./St.G.2, this unit participating in the attack on Poland and, subsequently, the "Battle of Britain". 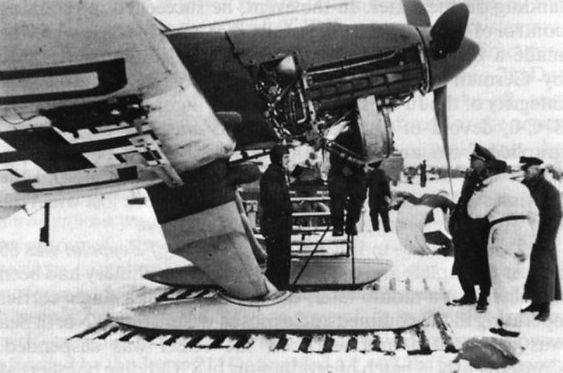 The Ju 87B-2/U4 had skis in place of the standard wheel undercarriage, but comparatively few aircraft were so modified. 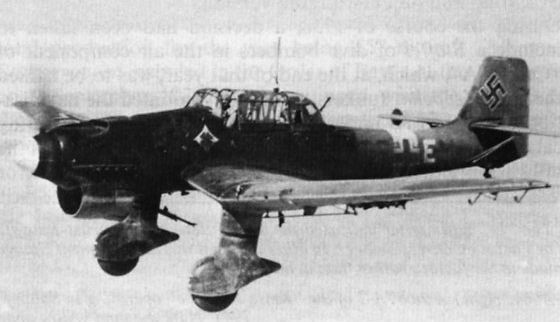 A Ju 87B-2 of the Hungarian 1st Independent Dive Bomber Group. A Ju 87R-2 of St.G.2 over Sicily in May 1941, this Gruppe being involved in attacks on convoys plying between Gibraltar, Malta and Alexandria. A Ju 87R-2 of St.G.2 with locally-applied temporary sand-and-olive camouflage which has obliterated the unit code on the fuselage side, this code having been reintroduced on the first aid kit access panel in the forward upper quadrant formed by the Balkenkreuz.